Most communities have a "farmer's market" in town where local farmers can sell their produce. In my community, the market is open twice a week and vendors rent small spaces that they fill with fruit, vegetables, local honey, fresh flowers, and handmade crafts. During the rest of the week, the market space becomes a covered parking lot. It's simple but very effective. But a city like Seattle functions on a much grander scale! 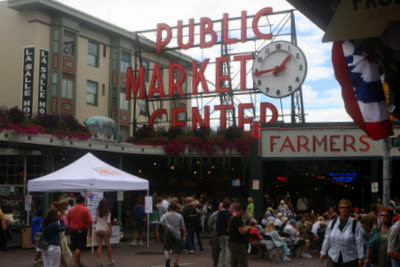 The Pike Place Market is a bustling public market center that draws vendors and customers from all over. Year around, much action can be seen and bargains found. From art to produce, Pike Place Market has it all! Hello! I've enjoyed looking around! You have a lovely blog and so many neat thoughts and ideas. I am going to go look around some more, but just thought I would introduce myself first! What a great place! Thank you for the tour. wow you nade an interestin trip. I love to see the pictures! I was just there a few weeks ago! Wish I lived nearby - the fresh cut flowers they sell are fabulous, and the prices are unbelievably reasonable. I'd love to have those flowers in my home every day! This is a place I really wanted to make it to this summer but we still haven't gotten that far. Fall is a beautiful time to head there so it may still happen. It does seem a lot like Granville Island market in Vancovuer, I love the flower shops, so so beautiful.. I can hardly walk past the pastry cases . .oh such yummy things. I always enjoy stopping by your blog. Loved seeing the Pike Place Market. I;m sure the smell was wonderful as you visited the lavender booths. Love the simplistic store front on Starbucks too.